CEO Daniel Lux will give a presentation at the Electonics of Tomorrow fair in Herning, Denmark at 14:00 on Wednesday, the 1st of November. Developing smart, connected products represents a big risk at many levels. 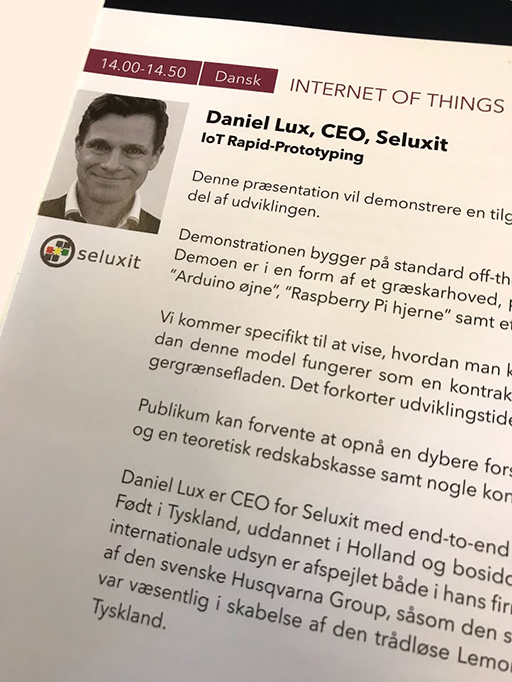 This presentation will demonstrate an approach to IoT rapid-prototyping as an integral part of the prototyping process. The demonstration is built on standard off the shelf components, notably a Raspberry Pi. The demo takes the form of a Pumpkin, fitting the Halloween timing of the fair. We call this demo the Pumpkin Pi. Visit our feature page to learn more about rapid IoT prototyping, and please feel free to contact us to hear more about how these tools can help you.